If you are in need of a reliable and affordable tree removal expert then we are the ones for the job. The Johannesburg North area is comprised of big and small tress in residential and commercial areas as well as the streets. Attempting a tree removal DIY is not easy and is often not advised, considering you may not have the equipment and expertise for such a job. But with our Sandton and Bryanston tree felling services, you do not have to worry about getting professional assistance. By working with our Sandton and Bryanston contractors, you can have the diseased or damaged tree in your space easily and safely removed. 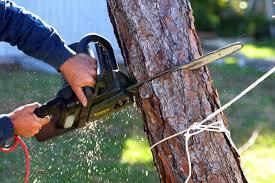 Our tree felling services in Sandton and Bryanston utilize the best equipment and our team of contractors are well experienced. Our advanced tree-removal equipment cuts trees of all sizes down without causing any damage to property or other surrounding trees. Instead of removing the whole tree, we can as well do tree shaping in Sandton and Bryanston. Additionally, you can also find our stump removal services and our instant lawn supplies useful for your needs. Do not take the risk of hiring incompetent people for your tree felling job. This kind of task needs an experienced tree removal contractor. They are the only ones that can guarantee the safety and effectiveness of the job. Thus, get in touch with our Sandton and Bryanston tree felling experts on 087 551 0614 today!